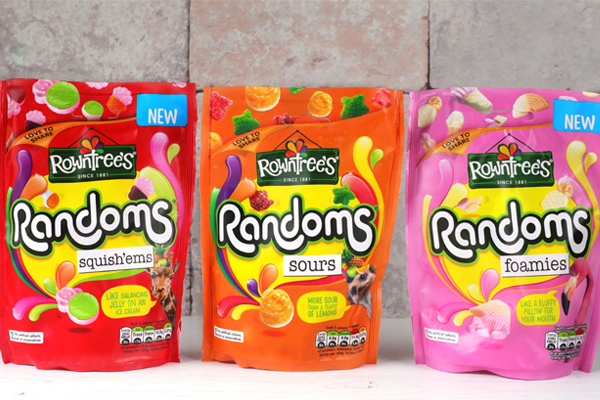 Sharing bags containing only Squish’ems (squishy foam and fruity jelly in one sweet), Foamies (foamy sweets) and sour sweets, Randoms Sours, are joining the existing range of Rowntree’s Randoms. A fourth sharing bag, Randoms Easter mix, is a seasonal selection of random Easter related shapes on sale now for the Easter season. Rowntree’s Randoms are jelly sweets in a variety of random shapes and with six fruity flavours of raspberry, cherry, blackcurrant, orange, lime and ice cream. The latest new shapes come courtesy of a Nestlé employee who has worked for the firm for almost three decades and will carefully hand carve the mould for each new sweet before it is taken to mass production. There are over 100 shapes, in 4 different textures and 6 different flavours which means there are billions of possible combinations of shapes for each pack and the chances of getting the same mix twice is mind-bogglingly unlikely. In addition to the new shapes, the green sweets, currently lime-flavoured, will now be apple-flavoured after the change proved more popular in testing. Hannah Smithson, assistant brand manager for Rowntree’s said: “We are so excited to announce all of this news for Rowntree’s Randoms’. There is truly something for everyone in the new range whether you prefer the jelly Squish’ems, the foamy sweets or something a little more on the sour side.